It's time for a bit of girl talk. I made this crocheted pouch for a very specific purpose: maxi pad storage. I like to keep a couple of pads in my purse for emergencies. I'm fortunate enough to be a "clockwork" kind of gal for the most part so I'm rarely caught by surprise, but as I'm sure most women would agree, it's always a good idea to have some extras on hand when you're out and about. I find that they get really battered in my purse, though; the wrappers fall off, the adhesive gets lint and other debris stuck in it, the pads themselves get smooshed and sometimes kind of dirty. I've had so many embarrassing moments with them too, usually when I reach into my purse for keys or wallet, and come up with a partially-unwrapped pad hanging onto the object I was trying to retrieve. Obviously, there wasn't much urgency, even though it gets to be a pain in the neck; I've been operating this way for nearly a quarter-century. I decided to make myself a little pouch a few months ago after a poster on Ravelry named G-Gurl shared a cute little crocheted pad-keeper she'd made. I thought about it for a long time and made up my own design. Would you like to see how I made it, and maybe make one for yourself? It's not necessarily a pattern but I think it came out nicely and I'm happy to share with my lovely readers. It's wordy, with lots of photos. 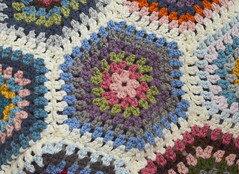 If you do make this pattern and blog about it or add it to projects on Ravelry, please link back to my blog. You'll need to measure your preferred pads to determine the size of your pouch. I use Stayfree Super Maxis and because I like to have two of them in my bag, I opted to make my pouch big enough to hold two of them stacked together, as in the upper left photo. I measured around the thickness (of the shorter side of the stack), across the long side, and the thickness of the two pads stacked. I crocheted the pouch in one flat piece to begin; my flat piece was about 10 inches long by 7 inches wide. This allowed plenty of room for the sides to be closed later and to create a basic closure flap at the top (I added more length at the closure end to dress it up, as I'll show later). Don't make your pouch too large because it will stretch a bit on its own. You could use any yarn you like, I think. I chose to use some Walk Away variegated sock yarn from my stash. This colorway is called Kicky. It's a blend, 75% superwash wool and 25% polyamide (nylon). I love the bright colors and it's also a pretty sturdy blend of fibers. I used about half the skein for my pouch, so you really won't need very much yarn. Use something you like, so you can feel good about that special time of the month (if at all possible). Choosing a hook was actually one of the hardest parts of this little project. I wanted the stitches to be relatively tight to help the pouch keep its shape, but I didn't want to have the crocheting itself be too fiddly. I ended up using an F (3.75mm) hook and it worked well. I think the crochet came out quite tight and it wasn't difficult, as tiny crochet can often feel to me. You'll want to use whichever hook works best for the yarn you choose, but I would suggest going smaller if you can, to keep the crochet tight or dense. If you tend to crochet tightly naturally, use a larger hook for the foundation chain and switch to a smaller one for the actual stitches. I opted to crochet my pouch piece in half-double crochet (hdc). This is my favorite stitch for a flat or solid piece of crochet. I just like the way it looks as a fabric. I chose to crochet my pouch piece lengthwise, so that the crocheted rows would be vertical on the finished pouch. I personally think this orientation gives a neater look on small objects. But you can certainly crochet your pouch piece in the other direction if you prefer, it's totally up to you. This is the flat piece as it looked after I finished crocheting it to the size I needed for my pouch. I love the way the colors placed themselves as I worked. I didn't expect it to look quite like this; it almost reminds me of Aztec weaving. This was such a pleasant surprise. You'll want to test your flat piece against the pads to be sure you've made it large enough. Yours may differ depending on the size of your pads and the way you've crocheted, but I was looking for about two rows of crochet on either side of the pads; this would ensure that I had enough space to close up the sides and still have room for the pads to sit inside. Then I took the pads away and folded up the bottom third of my flat piece to create the pouch space. ...inserted my hook into the end of the fold, and attached the yarn with a slip stitch through both layers at the corner of the fold. Then I crocheted straight up the side, attaching both layers. I did this with a single-crochet stitch, catching both the front and back loops of the stitches in both layers. I'm sure there are many ways to do this but I was less concerned with beauty and more concerned with sturdiness. I think it made a nice strong seam on the side and the little ridge looks cute to me, kind of decorative even. This is how the side looks after crocheting it closed. At the top of the pouch area, tie off the yarn, leaving a tail long enough to weave in later. You'll want to do this for each new part you crochet, leaving long tails when you start crocheting too. This will give a neater appearance and will also help reinforce seams if you choose to weave your ends back into them as I did. Lots of ends to weave in, but the pouch is taking its basic shape already. I put my pads inside to test it and determine whether the top flap would work as it was, or if I should add more length. It was plenty long enough but I decided to prettify the flap end by adding some more stitches and a simple shell border. I crocheted four rows (again in hdc) along the edge of the flap. I created a buttonhole by skipping a stitch (and doing one chain stitch in its place) in the second-to-last hdc row of the flap. Then I added a basic shell border to the very edge. It's easy-peasy, just a slip-stitch in the first stitch of the row, *5 hdc in the next stitch, slip-stitch in the next 2 stitches*, slip stitch in the last stitch of the row (repeat between ** as much as necessary). Next, I chose a button for the closure of my pouch. Choosing buttons is one of the best parts for me! I got out my button jars (and had lots of help from a little girl), looking for the right one. I initially wanted to use a plain red plastic heart button but then I saw these painted wooden buttons that were sent to me by my lovely blogging friend Janine this past summer when I won her Carry It Forward giveaway. I had two sizes and I chose the smaller one. Perfect! I love the rustic look and the daisies and hearts are very sweet. I sewed the button on with regular cotton thread and a sewing needle. Sewing onto a crocheted item can be tricky; sew lots of stitches, bury thread tails and sew over them numerous times - just make it strong. Button it up, et voila! You have your very own lady-supplies keeper for your purse, backpack or tote bag. I can't promise that it will last forever, but it will definitely help protect your pads. You could use this pouch for lots of other things too, you certainly aren't limited to feminine-hygiene products. Maybe you'd like to make a few of them and put different things inside each. I'm thinking about making a couple more as holiday gifts. I truly love to make things for myself, or others, that are simple, useful and beautiful! It's such a good feeling when I can make that happen. 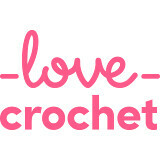 Crochet is one of the happiest parts of my life and it's even better when I can share an idea. I hope you like my idea and that you enjoy making and using yours; if you have questions, please don't hesitate to leave a comment and I will do my best to help. If you make a pouch, please leave a link so everyone can see yours! A very good idea! I use very different kind of pads, but I'll think about making a pouch for them. If I do, I'll show them to you. Beautiful Jennifer! I love the colors and it may help make that monthly :( a bit cheerier! I need a lot of help on crocheting and I wish I had your talent & skill. Great photos. Your personal pouch is very pretty and practical, indeed! Great idea, crafty and creative and fun! Love that 'cute as a button' button! I love it!!! And yes I have had so many of those moments! This is such a great idea and yours is so pretty!!! 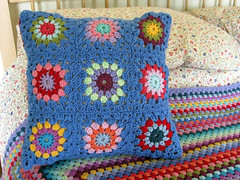 I have much to learn but this is on my list for when I can make more than a square!!! Have a lovely day friend and thanks for sharing!!!!! What a clever idea, and lovely colors pattern. What a cute personal pouch! Such a clever idea :) I might make one for DD1 as I'm not sure her current school bag has a zip-up inside pocket like her previous one did (although as she goes to an all-girls school there are fewer chances for embarrassment on the 'girly' front). I like the way the yarn pooled as well. Great idea, I know what you mean. What a brilliant idea, I think I need one of those in my bag. You're very clever to make this for your items.. good job! It's brilliant Jennifer, clever you for making up the pattern. I know exactly what you mean about embarrassingly battered sanitary supplies in your bag! I love your button jar, so much loveliness in there. Great tutorial Jennifer, and such a brilliant idea. I'm no longer in need of a 'time of the month' pouch, but I have two daughters and a daughter-in-law who would find this pouch very useful. Its lovely and who would guess what it held? I used to get really embarrassed having them loose in my bag especially if they accidentally fell out. That's a fab idea and it's so pretty, it's worked out really well. I can so identify with those embarrassing moments when you pull something out of your bag and a pad pulls out with it. I love this post on may different levels, Jennifer. I'd love a discreet pouch like this. But I also laughed out loud (it's the British smutty humour thingy in me). Is that wrong? You are lovely! Great idea! One time when I was working in an office was searching in my bag to get a tissue, as I pulled it out and blew my nose a male colleague came to ask me something. You can just imagine what it felt like to realise that was actually using a maxi pad instead!!!! I was totally mortified. what a great idea! I love the yarn you have used too, nice and cheerful colours! Excellent idea. Wouldn't have the use for it now but I could sure use one for umpteen other bits and bobs. Thankyou for the idea. That is a great idea! It would definitely come in handy :) I love the colors! This is a wonderful idea! It's so cute and colorful. I can not tell you how many times I've had pads falling out of my purse… very embarrassing!